TeamSpeak 3 continues the legacy of the original TeamSpeak communication system previously offered in TeamSpeak Classic (1.5) and TeamSpeak 2. TeamSpeak 3 is not merely an extension of its predecessors but rather a complete rewrite in C++ of its proprietary protocol and core technology. In this tutorial, we demonstrate how to use Voice Changer Software 8.0 Diamond (VCSD) for voice chat with TeamSpeak 3, one of the most popular instant messaging applications being used these days. With other voice chat applications, apply the same process to set VCSD 8.0 as your main voice processing program. In the Preferences window, we will switch from Hook mode to Virtual Audio Driver mode. - Click Settings >> Options to open TeamSpeak's Options dialog box. - In the Capture dropdown box, choose Microphone (Avnex Virtual Audio Device) for Capture Device(2). 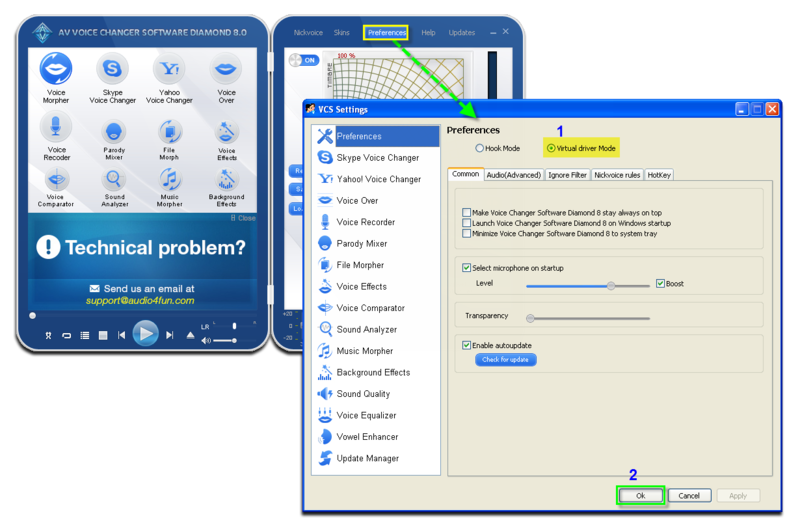 Return to Voice Changer Software Diamond 8 main panel, choose the morphing effects for your voice, and make adjustments until you are satisfied with the output voice. You should have known how to change voice using Voice Morpher. - You can now make voice conversation with TeamSpeak in game. The morphed settings for voice will be applied automatically. Note: While VCS Virtual Audio Driver is being set as the audio driver for TeamSpeak 3, do NOT turn off VCSD8 when doing voice chat with TeamSpeak 3. If you don't want to use VCSD8, change the audio settings of TeamSpeak 2 back to normal audio source.